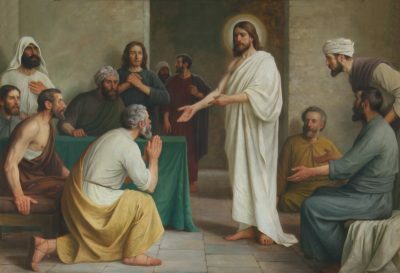 Jesus in today’s Gospel teaches His apostles how to interpret the Scriptures. He tells them that all the Scriptures of what we now call the Old Testament refer to Him. He says that all the promises found in the Old Testament have been fulfilled in His passion, death, and resurrection. And He tells them that these Scriptures foretell the mission of the Church—to preach forgiveness of sins to all the nations, beginning at Jersusalem. In today’s First Reading and Epistle, we see the beginnings of that mission. And we see the apostles interpreting the Scriptures as Jesus taught them to. God has brought to fulfillment what He announced beforehand in all the prophets, Peter preaches. His sermon is shot through with Old Testament images. He evokes Moses and the exodus, in which God revealed himself as the ancestral God of Abraham, Isaac, and Jacob (see Exodus 3:6,15). He identifies Jesus as Isaiah’s suffering servant who has been glorified (see Isaiah 52:13). John, too describes Jesus in Old Testament terms. Alluding to how Israel’s priests offered blood sacrifices to atone for the people’s sins (see Leviticus 16; Hebrews 9–10), he says that Jesus intercedes for us before God (see Romans 8:34), and that His blood is a sacrificial expiation for the sins of the world (see 1 John 1:7). Notice that in all three readings, the Scriptures are interpreted to serve and advance the Church’s mission—to reveal the truth about Jesus, to bring people to repentance, the wiping away of sins, and the perfection of their love for God. This is how we, too, should hear the Scriptures. Not to know more “about” Jesus, but to truly know Him personally, and to know His plan for our lives. In the Scriptures, the light of His face shines upon us, as we sing in today’s Psalm. We know the wonders He has done throughout history. And we have the confidence to call to Him, and to know that He hears and answers.